The magazine had reported last Christmas that the seven-time world champion could walk again. 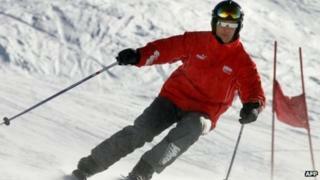 But Mr Damm said that Schumacher, 47, "cannot walk" more than two and a half years after the accident. Bunte had quoted a source at the end of last year as saying that Schumacher could manage some steps with the help of therapists and could raise an arm. At the time, Schumacher's agent, Sabine Kehm, released a statement denying the story, saying: "Unfortunately we are forced by a recent press report to clarify that the assertion that Michael could move again is not true. Schumacher suffered a head injury in a skiing accident in France in 2013. Very little is known of the sports icon's recovery as his family has strongly protected his privacy. In February, his former boss at Ferrari, Luca di Montezemolo, said: "I have news and unfortunately it is not good."